England appeared down and out on day three at Lord’s until Jos Buttler and Dom Bess revived home hopes in the first Test. The Cricket Debate podcast: Jos Buttler and Dom Bess keep Pakistan at bay Last Updated: 26/05/18 9:02pm England appeared down and out on day three at Lord’s until Jos Buttler and Dom Bess revived home hopes in the first Test. 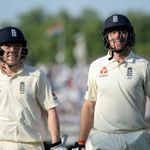 SKY SPORTS CRICKET PODCAST (listen here)Bob Willis and Nick Compton join presenter Charles Colville to reflect on how an unbroken seventh-wicket stand of 125 has, at the very least, extended the opening Test of the summer into a fourth day. Bob is encouraged by the signs that Buttler can transform his white-ball form into Test success – but says it’s a small crumb of comfort when England’s much-vaunted top-order lacks any sense of consistency. The pair also reflect on the achievements and character of Bess, who chalked up his maiden fifty in his first Test – and his first match at Lord’s! Watch day four of the first Test between England and Pakistan from 10am, Sunday on Sky Sports Cricket with The Cricket Debate to follow at 7pm.